Be honest. Have you ever wanted to pray this prayer? Have you ever asked God to punch your enemies in the mouth and destroy them? Sure. We all have. But I think there is a general misunderstanding of this verse. 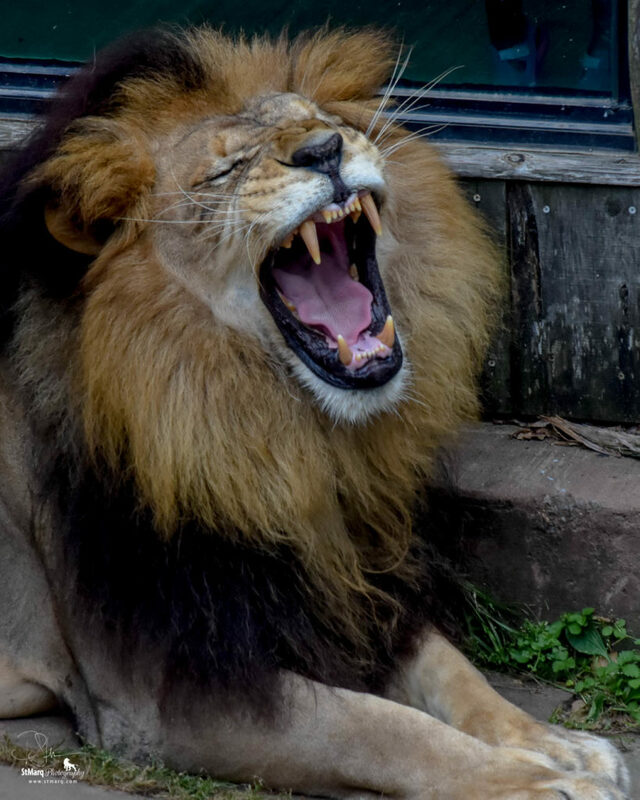 What the psalmist is actually saying is that he wants God to de-fang the lions. He wants them to be unable to rip him to shreds anymore. He wants God to take away their hurtful power and turn them into kittens. This is Bakari, the Little Rock Zoo lion and one of the most beautiful lions I have photographed in a zoo. But here, he is playing the part of an enemy with sharp fangs. Another way to defang an enemy was when Daniel was in the lion’s den overnight with hungry lions. The Lord closed the mouths of the lions. God took away their power to be hurtful. And still another way, still from the book of Daniel, is when the king got so angry at Shadrach, Meshach and Abed-Nego, he threw them into the fiery furnace, expecting them to die a horrible death. But when he looked in, he saw them unbound and walking around with another person that looked like a son of one of the gods. I believe this was Jesus, “defanging” the fire and Nebuchadnezzar. When they came out, the three Hebrew leaders didn’t even smell like fire. They were untouched by it. 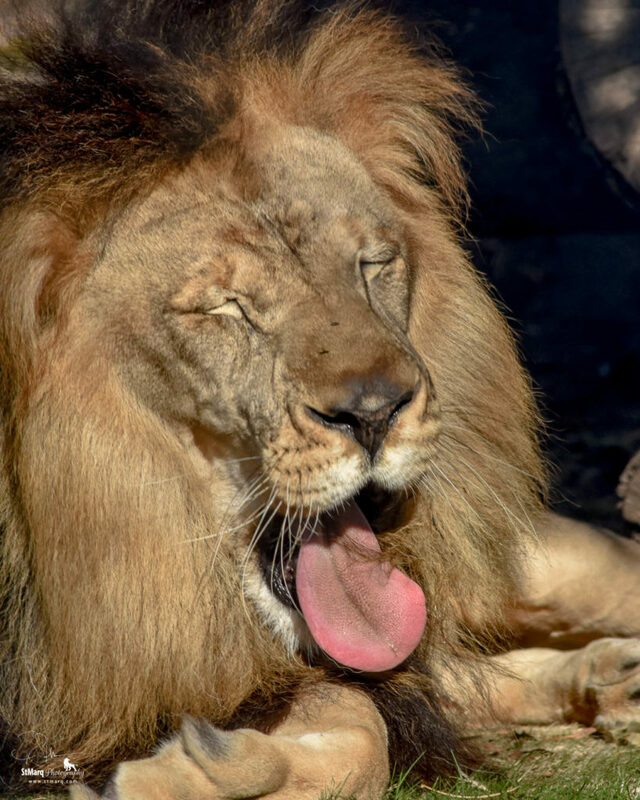 This is a somewhat sleepy Bakari playing the part of the “defanged” lion. This may have been what the lions looked like when Daniel met them. We need to give God a chance. He can repay people however He wants. If you are struggling with this, remember that God is just. Ask Him to defang your enemy so they can no longer hurt you. Then, allow God to do whatever He wants after that. You may be surprised because He just might bring them to repentance and make them a brother or sister in Christ because of your example! Why am I going through this? Why do I have to suffer? Why did I lose my family? Why did my wealth vanish? Why am I suffering with a serious disease? “Why?” is the question that many people ask. Thus far in the book of Job we know one reason why, although Job does not: Because God wanted to prove Job’s worth. He was a good man and would continue to be so, even through suffering. But there are greater reasons that Job will find out later. That is the key for us as well. When I was in the worse part of my cancer battle, I never asked the question, “Why?” I figured I am not Job. I am a sinner that is saved by grace and therefore, I deserve whatever God allows in my life. It was tough. Sometimes I thought, “Why doesn’t God just take me home?” But never, “Why?”. This gave me some peace in the situation. Of course the context is Peter being stubborn about allowing Jesus to wash his feet. But the answer has eternal consequences. Hope comes from knowing that what God is doing in my life now I may not understand, but there will come a time, either in this life or the next, that I will get it. The hurt, the pain, will have an answer. For Job, his conclusion was that the Almighty was inflicting some horrible things on him for the Sovereign’s enjoyment. Just because God wanted to see Job suffer. If that was the case, then how could one stand before such a maniacal Being? How can anyone enjoy a peace-filled life knowing that any minute, God is ready to strike you down with an illness or with great loss? If you are suffering today, know that God loves you and has a plan for each and every tear. In fact, He puts those tears in a bottle (see Psalm 56:8). He won’t waste one ounce of pain. He will use it for your good and for His glory. The tendency for those of us suffering is to blame God for the pain. We ask questions like, “Why are You doing this to me?” They are questions Job asked thousands of years ago. We’ll see later on in the book that “Why?” is the wrong question. The correct question is “Who?”. Who are you Lord? Reveal yourself to me. Help me to see you in my pain. When that question is asked, God delights in revealing Himself and when we understand that our accusations about Him were all wrong, He restores our souls and refreshes us in His presence with peace. Job has suffered a terrible loss. He lost his kids, his wealth and his health all within a short amount of time. It was wave after wave with precious little time to breath. When his friends showed up, they were kind at first, but when Job expressed the thoughts of his heart and the pain he was going through, things took an unkind turn. Here Job is responding to Eliphaz, but not really. He is addressing his complaint to God. He is in pain and agony and needs to express his heart. I have encountered Job’s friends. They are people who always want to correct someone’s theology rather than to hear them out, have compassion on them and point them to the love of God through Jesus Christ. When we are in the throes of pain, we are not thinking correctly. We need to express our pain, but saddly in our culture, we are told that pain is weakness and a lack of faith. Therefore, we play games when it comes to our pain. A brother might ask us how we are doing. We say, “Fine.” The brother walks away. Nothing was accomplished accept the enemy’s victory in isolating the one with pain. We see this in the military. Guys who have had a tremendous amount of stress due to war come back to a “normal” life when their tour is over. Then they are asked, “How are you?” The answer? Again, “Fine. I am doing good. Still in the fight.” When everyone can see they are not doing fine. They need help, but won’t ask for it. It is weakness. I would venture to say that this attitude is proliferated by the people around us. Job’s friends. If we express our pain, we immediately get pad answers: “It’l get better”, “You gotta have faith”, “Trust the Lord, man.” These are all good biblical answers. However, they work just about as much as when a Christian passes a brother that is in need and says, “be warm and full”, but doesn’t provide the means to be warm and full. You see, our theology is correct, but living that theology has become academic, cold and un-helpful. We have to understand that a person who is in horrible pain and agony doesn’t know if they are ever going to get better. I have been there. We begin to think, “This is just how life is. I am going to be in pain every single day, then I will die and it will all be over.” There were times I longed for death because there was no hope. I told my doctor that I had given up and not to help me. His response was, “Do you believe in God?” I said, “Yes.” he said, “Good. He believes in you.” At that moment a spark of hope went back into my life and I was once again ready for the fight. Remember that a person that is suffering doesn’t need a theology lesson. They don’t need to be told that, “The Bible says…” They need to be shown what the Bible says. They need you to be the living epistle of the love of Jesus Christ in their lives. After the pain, when hope is restored, you can then get them into a good Bible study and show them why you did what you did. Remember that faith comes by “hearing” the word of God. I would venture to say that a person in pain will hear your life a lot louder than black and white on a page. Once they do that, then you can show them the black and white and why it is so important. Expressing our pain to God is not sinful. If that was the case, then the book of Psalms would not have been written. God is big enough to handle your pain. In the end, Job did see better days. In fact, he saw good once again. But not before God revealed Himself to Job. The best way to love and serve a person in pain is to show them the Jesus that you know and love. The best way to do that is with your life. Bildad, the Shuhite (arguably, the shortest guy in the Bible… go back and read that again… the Shoe-hight?) Anyway… Bildad, one of Jobs friends had just laid out a great argument. One that suffering people must endure a lot. The argument is this: the wicked are punished and the righteous are rewarded. Even without ‘friends’ like this to point out our shortcomings, we have an enemy and a mind that constantly puts these thoughts into our heads when we are suffering. A person might come to Christ and then get diagnosed with cancer or lose their finances or get fired from their job or their child might die. Immediately the thought goes to, “What did I do? 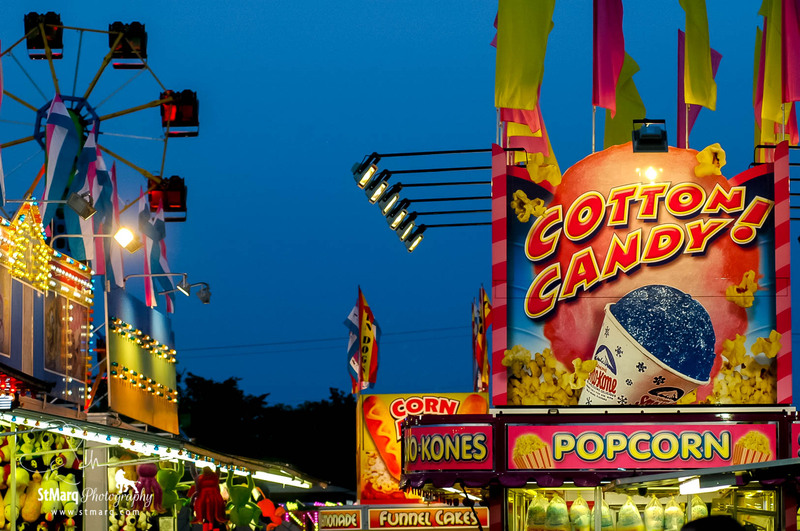 What sin did I commit?” It must have been that lustful thought I had last week, or because I listened to secular music, or because I didn’t tithe. God is now angry with me and therefore, I am now under his condemnation. I must be a horrible sinner for God to afflict me with such a terrible trial! I had my kids tell me that one of their friends told them that I was a terrible sinner because I was diagnosed with cancer and only sinners get diseases. Righteous people are never sick. People who are full of faith never struggle with finances. He would have made Job’s friends proud. If you are suffering today with a disease or any other pain and are a believer in Jesus Christ, know that your sin has been washed at the cross. You are not under the judgment or condemnation of God. (See Romans 8:1) There are many reasons for suffering. Some of them are self-inflicted. For instance, if you used to go out and get drunk every night you are probably going to have liver problems. If you are constantly gambling you can expect to have financial problems, and if you married and have a family, you will destroy those relationships. However, these are not the judgments for sin, but the consequences of sin. There is a difference. Have you repented? God has cleansed you. Will there still be consequences, perhaps. But you are free from the judgment of God. Job’s problem wasn’t some blatant sin. His problem is that he could not see God in his suffering. One thing I know is that I can endure A LOT if I know that God is with me and I am walking in the will of God. If I feel forsaken or am deceived into believing that I am under the judgment of God, then my endurance and hope will cease. I think this is where Job was for a very long time during the dialog with his friends. May the LORD richly bless you with His intimate presence, knowing that your sin is removed. May you understand how much God loves you and is with you, even in your suffering. He is not vindictive, waiting to destroy you because you have sinned. Actually, He is waiting for you to come to Him and change your mind about His greatness and His mercy. May you know Him in your suffering. May you see Him in your pain. At first glance, you might think that this is in response to some sin. The Lord has kept you back from honor… because you have sinned and done evil in His sight. But that wouldn’t be the case. In fact, it was quite the opposite. Balak, king of the Moabites wanted Balaam, a wayward prophet of the Lord to come and curse his enemy. The problem? The enemy was the Children of Israel. They were the chosen people, the people of God. These are the words of Balak, “The LORD has kept you back from honor.” After asking three different times to curse the people, Balaam actually ended up blessing the people—one time without even being asked! Balak was going to pay Balaam a fortune to curse the people. But now, Balaam wouldn’t receive a penny. What is it that the world would want you to do that is outside of the word of God? What allurements or delights? If you follow what Christ says, will they say, “The LORD has kept you from honor?” Better to be a person of integrity than to be honored by the world. When the world tempts you with all it’s enchantments, remember your Creator. Remember what God has said and whatsoever you do, may it be done in the Savior’s name. If you have lost hope in whatever you are going through, might I encourage you to visit www.stage4ministries.com where you will find encouragement for your battle? Send us an email and let us know how we can pray for you and what we can do to help. For those of you who know me, you know my story. 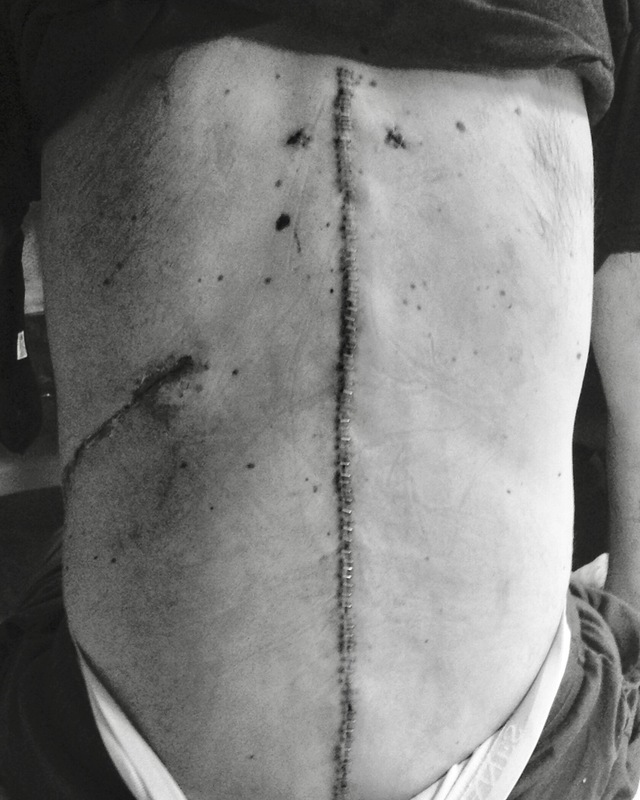 I am a stage four cancer survivor/battler who endured four surgeries, three of them major, where my left kidney was removed, the cancer later metastasized and then was removed from my nerves, muscles and spine. I have a cage where my L2 and L3 vertebrae were, and metal rods and screws from T10 to my pelvic. The cancer has metastasized again, and is currently in my lungs, last we looked. After 5 immunotherapy treatments this year, the metastatic cancer reduced in the lungs by 50%, which is awesome! 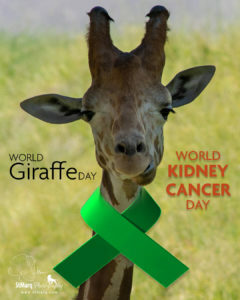 It is interesting that World Giraffe Day and Kidney Cancer Awareness Day are on the same day. During my last surgery, where my vertebrae were removed and hardware placed, surgeons had to deflate one of my lungs, then keep me under close observation, making sure my lung was properly inflating. Nurses did this by waking me every morning at 4am in my ICU recovery room, bringing in a portable X-Ray machine and placing a stiff film board behind my back. Obviously, this was very painful. The X-Ray machine was a box with a neck that had the x-ray dish (I am guessing) on it where they pointed at me and took the x-rays while laying in my bed. The machine must have been from the children’s area because it had spots all over the box—like a giraffe. After getting these twice, on the third morning I woke up a bit early and saw the nurse in the room. I asked her if they were going to bring the giraffe in this morning. 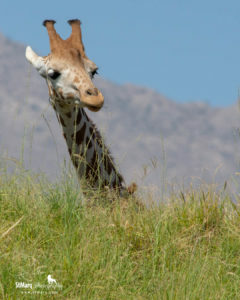 She gave me a puzzled look and asked, “What giraffe?” My wife, who was sitting in the room, said, “Oh, he’s talking about the x-ray machine.” Then the nurse laughed! My wife went to the gift store and bought me a plush giraffe. It is a reminder of all I went through and that I survived. I told people I hated giraffes because of the x-ray machine. 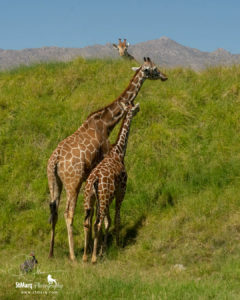 But, in truth, I love giraffes! I am alive today not because I am a good person or because I am strong. I am a weak person. I am alive today because I trust in a strong God. I trusted Him when I found out He sent His Son, Jesus Christ, to save me from my sins, and I trust Him for what the future holds. I don’t know the day of my death. I know that it must come. But I do know what will happen after death. I have hope. That hope gives me hope in this world as well. I will continue to fight. I will continue to tell of the faithfulness of God even though I have been unfaithful and unworthy of His love. Someone who was going through a life threatening situation once asked me why God would keep people like her and I around. My response was that God loves us. Not because we were better than anyone else, not because we were so cute, not because we were good people. He loves us just because He loves us. That is all. On this, World Giraffe Day and Kidney Cancer Awareness Day, may I offer you hope. I thought that if I would just stick my neck out, you might spot the hope I have and make it your own. Message me if I can be of any assistance. Giraffe photos shot by me at The Living Desert zoo in Palm Desert, California.To keep up with my images, follow me @stmarqphotography on Instagram or Facebook. If you know of anyone who needs hope and would like to be encouraged, follow @stage4ministries on Instagram or Facebook. My boys, Jared and Andrew took me to my appointment and were in the room with me. My doc showed us the scans. There was slight growth in one of the tumors. However, the one next to it appeared to have what the doc described as cavitation in it—a hole—in the middle of the tumor! Doc said that it appeared to be starved for blood and was dying! Sometimes this can happen on its own, or because the chemo is killing the tumor. More on this in a minute. Doc said that since my tumors were localized and had not spread anywhere else in my body in three years, I was a candidate for irradiation!!!! Normally they do not use radiation on Stage4 cancer patients, because tumors can and usually do spring up anywhere in the body. Therefore, to radiate one area doesn’t really change anything. However, because the cancer is in one area, I am a candidate for the procedure! I spoke with Dr. Shafizadeh this afternoon as well and he was very excited about the news. I told him that at this time of thankfulness, I was grateful for him and all that he has done for me. What a blessing to know such a great Neurosurgeon and humble man. He told me that he whole-heartedly agreed about the radiation and even said that if it worked, I could then manage the cancer like others manage diabetes. I told him about Stage4 ministries and he was excited about that. 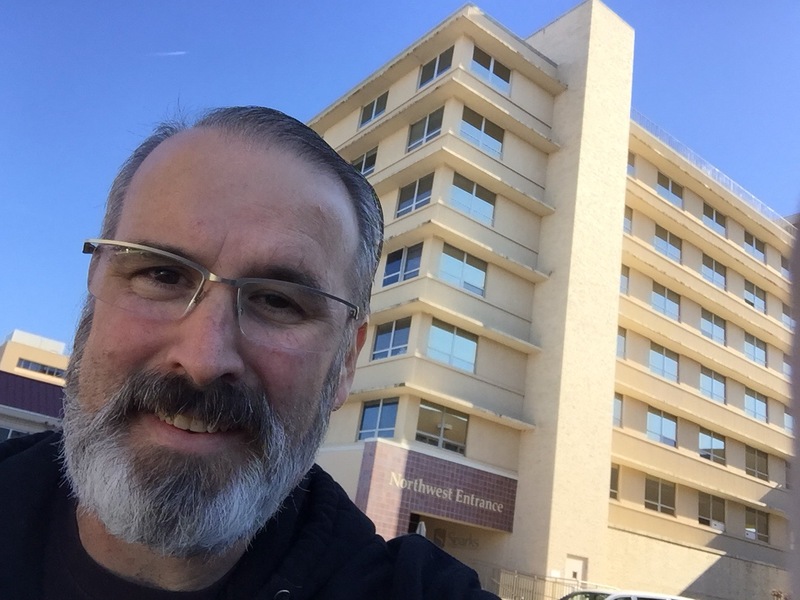 I told my oncologist that I have been speaking at churches about my testimony. He told me that I need to make sure I tell people that my testimony is not “normal” for cancer patients. “There is a Higher Power at work,” then he paused and looked at me and said, “I believe that.” This was amazing to me. Of course God put these amazing men in my life. Of course He provides this medicine. But all praise must go to Him for what He did with them and with the meds in my body. The Higher Power is none other than Jesus. What a joy to know that He is still on the throne! Praise God. Oncologist recommends that I stay on my chemo drug after radiation so that it will keep new tumors from growing. At this point, Lord willing, I would once again be at “No Visible Signs Of Cancer”!!! No cancer that can be seen in my body. Please pray that my insurance change in California, so I can get an appointment at City of Hope and we can get all this going. Please pray that the Lord’s will is done and that the extension of my life will be used for His glory alone, bringing many hope through faith in Christ!! Love you. Thank you for reading. Thanks for your prayers and support. You are a great blessing to us. May the Lord Jesus richly bless you. 3 years ago today God used a special man and doctor in our lives, to give Steve Marquezmore time here on this earth. And God provided the miracle. Steve was still Stage 4, but active tumor free for two years. And he can walk! Praise the Lord! We are still grateful and thankful. Went into surgery at 10;05am. ……Still working….getting close to closing. Said about another hour. …..Dr just came out. Everything went well with very little blood loss. PTL!!! Goes from T10 to the Ilium. This precious dr was determined to get the rest of that tumor and he DID!!!! He said there is a very small amount left in Steve’s muscle and he said they will ‘get it’ with radiation. One of Steve’s nurses was just here to check on him. She was so excited at the news. As am I. “Fantastic news. Please give Steve a hug for me. 10.5 hours total surgery time.